So, imagine a poster or an ad that changed content depending on the reader? What would your ad say to a twenty-something college graduate or a 40-year-old working mom? It looks like smart billboards are on their way, which mean that smart bus shelter ads and electronic sign boards won't be far behind. Better get to work on your focused ad content now while you have a chance. Your first order of business will be determining who your ideal customers are. Not sure? Maybe it's time we meet for lunch and do a little self business analysis before this new wave advertising overtakes us. But first, check out the article here. The cavemen did it first. A drawing of several antelope running in a group meant a good hunt or plenty to eat tonight. A sun scrawled onto a rock could mean a new day, a drought, or maybe a note to turn your iWatch ahead for daylight savings time? We are experiencing an explosion of infographics and pictorial images like never before (think emojis). Today we communicate in short-hand, on Instagram, Facebook and Twitter. Copy longer than 140 characters is considered too wordy. Social media has forced us to think more simply, concisely and accurately using both words and pictures. Infographics as part of the graphic designer’s tool chest have been with us for a long time, helping to stylize and synthesize complex or wordy ideas into short, easy to digest and understand pictures. USA Today does an especially good job of using infographics to convey information. In fact they have done such a good job using them that the phrase “USA Today-style” as designer-speak has become synonymous with infographics, much like “Googling” has become synonymous with an info search. In their newest annual report, South Jersey Industries, the parent company of South Jersey Gas, elected to use infographics to tell their story. art270 created several pages of graphics to call out the most pertinent and interesting facts and concepts from the copy. The result is a bold, visual presentation that tells the story in a way photos or traditional illustrations and charts can’t. Need to shoehorn your story into a too-small space? Or wishing you could make your point without writing a hundred words? Call art270 to create memorable infographics to deliver your message with style. 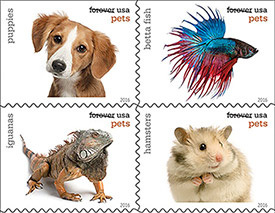 If you haven’t already heard, I’ll make your day by letting you know that postal rates are actually dropping on April 11. This isn’t an April Fool’s joke. The letter rate is actually dropping by two cents. Time to toss aside those smart phones and let art270 design a custom eye-catching invitation or direct-mail marketing promotion. Nothing has the same impact as a hand-stamped envelope that you get in the mail. Read more about the new postal rates then give us a call to get started on your next promotion. Are you a doodler? I remember my little brother doodling with his finger in the air while he sat at the dinner table. My family couldn't see what he was drawing but if we asked him, he would describe his drawings of the Red Baron in a dogfight with a Sopwith Camel somewhere in the skies over France. We were so intrigued by his detailed descriptions that we could almost hear the battle taking place over our kitchen table. I used to doodle all over my school notebooks and even on my canvas school bag — and as I recall, so did many of my schoolmates. I think doodling tends to fade a bit as we get older and life takes over our spare moments. The computer has certainly put a dent in our pencil to paper fantasies. 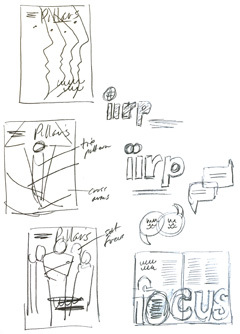 As a "big kid" now, my doodles have turned into focused pencil sketches as I visualize layout possibilities for a publication, logo, or a webpage. Sometimes I sketch on a scrap of paper, sometimes on a napkin next to a cup of coffee, but whatever form the sketch might take, it's still a great way to think through ideas long before I go near a computer. It's amazing how much creativity can come from a 2 x 2 inch drawing. Google has kept doodling and illustration alive on their ever-changing homepage. Check out some of the illustrations that have been submitted by students from across the U.S. for consideration. Vote for your favorites and keep those doodle dreams alive. Yes, I said it. Scrapple — that oh-so-Philadelphia delicacy that you either love or hate. I grew up in Philly and found it adorning my plate, usually next to a pile of scrambled eggs my mom would serve for breakfast every now and again. “It’s a treat,” Mom would say, but for me scrapple looked like anything but a treat. After all, who named it scrapple? Eventually, I actually learned to like it. Prepared well, with a good brown crust that adds a bit of crispy texture and a bit of ketchup, it’s pretty good. If you like sausage and bacon for breakfast, it’s an interesting alternative, and once you’ve eaten it, you can brag that you’re a real Philly-ite, even if you only taste it once. Kind of like one good jog up the “Rocky” steps at the Art Museum. 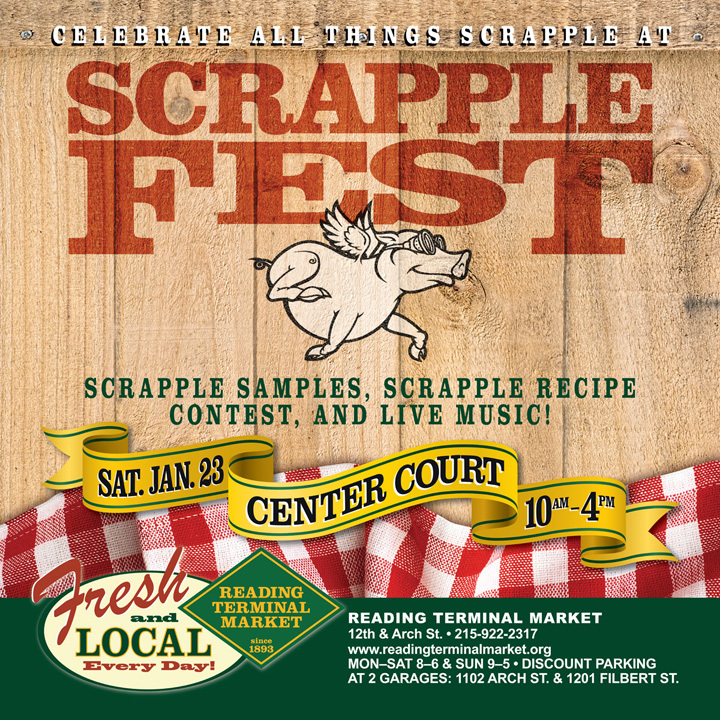 Reading Terminal Market is throwing a uniquely Philly event on January 23rd — Scrapplefest. (See the attached poster that art270 created for the event). If you want a chance to taste a variety of scrapple recipes without having to commit to a plateful, this is the event for you. There will be lots of tasting opportunities from a variety of Market chefs. If you’re a real scrapple aficionado then this event is for you too. Where else will you find all things scrapple under one roof, and lots of other great food options to boot? Mark your calendar. Need us to help you make pigs fly or turn your new product into the next sensation with great graphics? You know where to find us.